Mickey and Judy put on a show in Babes in Arms. The Stars: Mickey Rooney and Judy Garland. Source Material: The Broadway musical Babes in Arms by Richard Rodger and Lorenz Hart. 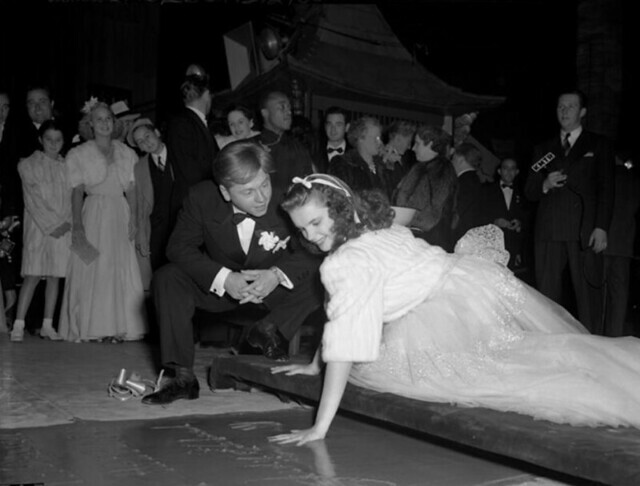 A watchful Mickey Rooney oversees Judy Garland placing her handprints outside Grauman's Chinese Theatre at the premiere of Babes in Arms (1939). Awards: Nominated for two Academy Awards: Mickey Rooney for Best Actor and Roger Edens and George Stoll for Best Music, Scoring. 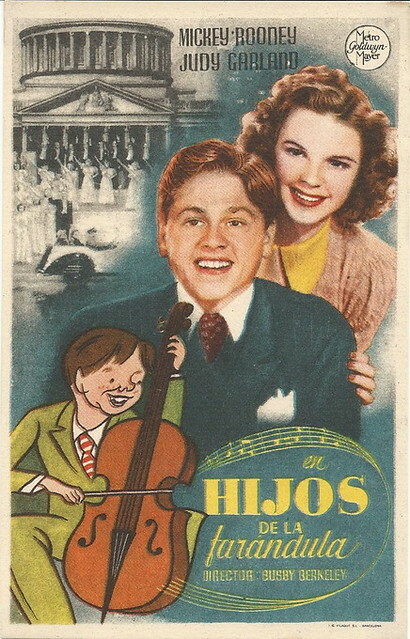 The Plot: Irrepresible teenager Mickey Moran (Mickey Rooney) stages a backyard musical with his best girl, Patsy Barton (Judy Garland), to save the fortunes of his parents (Charles Winninger and Grace Hayes), a down-on-their-luck vaudeville team. Mickey and Patsy are opposed by the meddling Martha Steele (Margaret Hamilton) and her snooty nephew (Rand Brooks). A Spanish language poster for Babes in Arms. Backstory: Producer Arthur Freed was given his own production unit at MGM as a reward for steering The Wizard of Oz to success. His first film was Babes in Arms a revamped version of the Rodgers and Hart musical that was specially tailored for the talents of Garland and Rooney. The duo were MGM's top juvenile stars and they had already appeared in two popular films together: Thoroughbreds Don't Cry (1937) and Love Finds Andy Hardy (1938). Freed's formula worked. Babes in Arms was one of the top box-office draws of 1939. Freed would go on to produce smash hits like Meet Me in St. Louis (1944) and Gigi (1958) and Garland and Rooney would be teamed in seven more films. Mickey (Mickey Rooney) and Patsy (Judy Garland) share a soda in Babes in Arms. Best Performance: Mickey Rooney as Mickey Moran. Rooney is a manic ball of energy as the irrepressible teenager who wants to break into show business. He sells every big musical number like his life depended on it, but he is most effective in his quieter moments when the audience sees that underneath all the bravado he is just an insecure teenager who longs for the approval of his demanding father. Rooney is also an ace impressionist: He does spot-on impersonations of Clark Gable, Lionel Barrymore and even Franklin Roosevelt. Best scene: The title number is staged by Berkeley as the most bizarre teenage riot in history. The finale has to be seen to be believed (you can see it in the clip below). Douglas McPhail, who was a minor-league version of Nelson Eddy, belts out the number on top of of a playground slide while Rooney, never one to give up the spotlight without a struggle, gestures wildly behind him. This is all happening while the rest of the cast start a bonfire behind them and then proceed to dance around it. Best Line: "We're only kids now, but someday we're gonna be the guys that make you laugh and cry and make you think that there's a little stardust left on life's dirty pan." Mickey Moran, explaining his love of show business. The songs: Only three songs remained from Rodgers and Hart's original musical: Babes in Arms, Where or When and The Lady is a Tramp (that number was only played in the background). The rest of the songs came from a variety of sources. Freed added a couple of his own songs: Garland sings I Cried for You while pining for Rooney and Garland and Betty Jaynes duet on You Are My Lucky Star. Freed teamed up with Nacio Herb Brown to write Good Morning for a Garland and Rooney duet. Finally, The Wizard of Oz songwriters E.Y. Harburg and Harold Arlen wrote the finale number, God's Country. They're Off to See the Wizard: Garland and the Wicked Witch of the West herself, Margaret Hamilton, began working on Babes in Arms shortly after finishing The Wizard of Oz. Scarlett O'Hara's first husband, Rand Brooks, also showed up as Hamilton's snooty nephew. 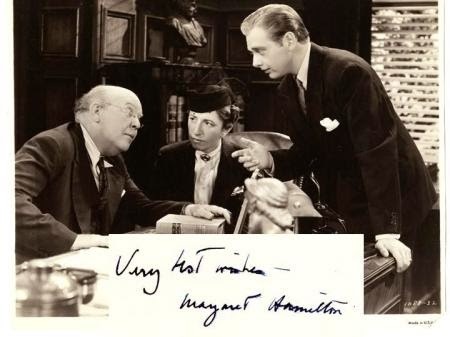 Margaret Hamilton signed this still from Babes in Arms, which also features Guy Kibbee (left) and Rand Brooks. Fun Fact: A segment of the finale where Garland and Rooney lampoon Franklin and Eleanor Roosevelt was removed from the film after Roosevelt's death in 1945. It was restored to the film when it was released on DVD in 1992. 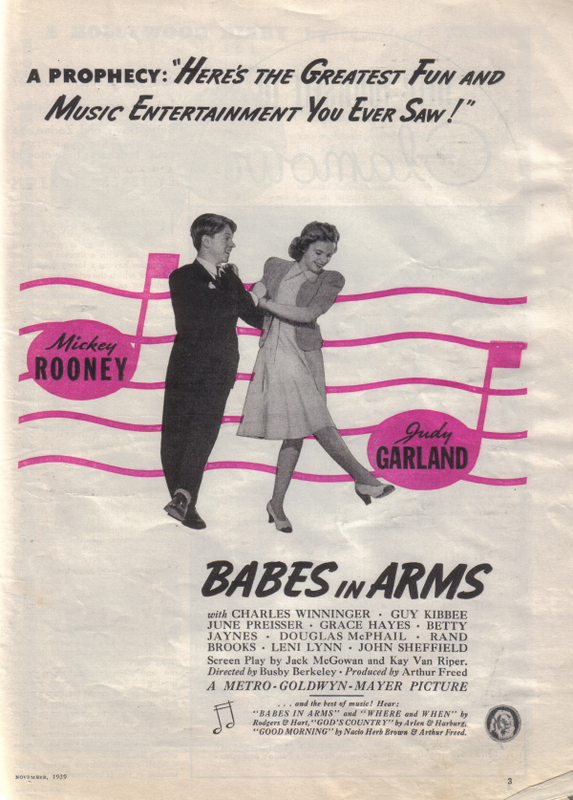 Why it's essential: Babes in Arms is somewhat dated (the minstrel number is awful) but the high energy performances of Rooney and Garland make this film a treat for anyone interested in old Hollywood films. Next week, William Holden moves from classical violinist to pugilist in Golden Boy.